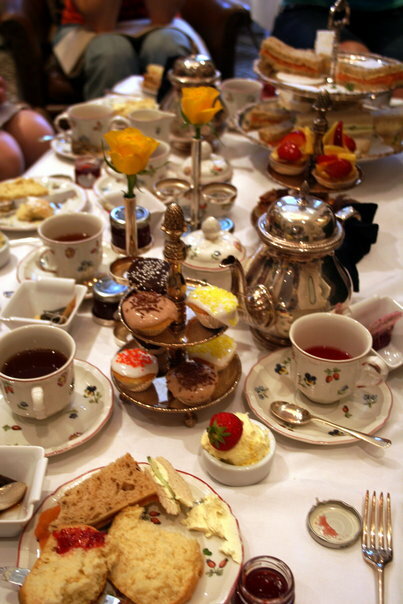 This was the magnificent spread of our high tea in London… obsessed! I few weeks ago, I was invited over by a dear friend for a playmate and tea time. It was FABULOUS. She had these incredible “southern style” scones to go with it- more like biscuits actually and my son and I couldn’t stop eating them. Absolutely heavenly and I need to get that recipe! But in the days that followed I started missing London and more traditional scones. I went to London as a summer study abroad program when I was studying at Pepperdine and while there I got to go to high tea with one of my best friends. Hands down one of my top 10 favorite travel memories. I wanted to mix things up a bit and not go to Pinterest again, so I looked through my inherited Martha Stewart’s Baking Handbook and found 3 options for scones. Currant, lemon, or chocolate. I decided to put it to a vote (except currant… because we already read about my improvisation with that during my irish soda bread baking). The votes were… almost unanimous (aside from a few questions about bacon or blueberry or chocolate lemon being a write in vote option…) for lemon! Which is awesomely fine with me. I’m obsessed with lemon. Seriously. Plus, the idea of lemon scone plus lemon curd just sounds like perfection. Pair that with some Lady Grey tea and you’ve got yourself a fabulous afternoon. This was post-freezing because I was too tired to document making the dough the night before. This was just before they got an egg and cream wash to make them nice and brown and just a bit crisp on the outside! There is something ritualistic and comforting about tea. I mean don’t get me wrong, I love my coffee in the morning (and… afternoon… and evening…) but tea just has a peaceful effect. Maybe it has to do with the ritual I mention. I usually drink my coffee black unless I’ drinking espresso. Tea, I usually add honey or milk or I go through the time of using loose leaf blends and allowing the tea to steep before the next step can happen. It’s beautiful. And just as the ceremony of tea requires waiting between steps, so did this recipe for scones. I started working on them Tuesday night after I got home from tutoring (lucky for me my husband made a grocery run to pick up the missing ingredients) and then the dough needed to sit overnight in the fridge before I could move onto the next step in the morning. I have to say, I think the anticipation made them taste even better. After freezing overnight and being woken extra early by a cranky kid, I was more than ready to bake these beauties and have a taste with a morning cup of caffeine. They did not disappoint. 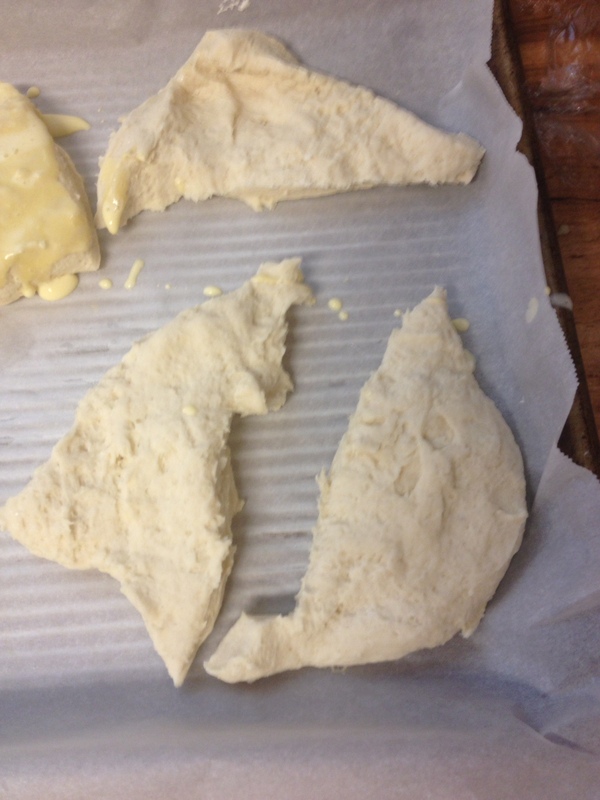 The lemon was subtle but cut the buttery richness of the scone well. The texture was great. not too dense which was my fear in baking them. 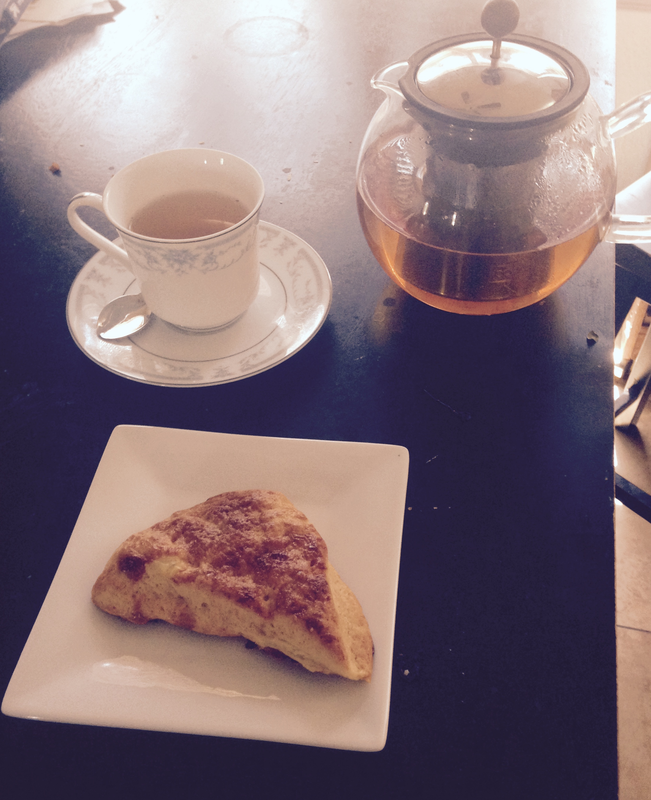 It may be crazy hot out, but hot tea and scones was still a little piece of perfection.